Hello! It has been two weeks since our last devlog, and today we're talking about the progress that we've made since then. Mainly we'll be covering under-the-hood improvements which brought faster rendering times. Now we have a smarter approach to how we load and manage each graphical parts of your character. We're storing a limited number of SVG files inside the memory, so the next time it's used again by the renderer, those files can be loaded faster compared to when we're loading from disk. Based on our testing, up to 55% percent improvements in rendering time can be achieved with this change implemented. We now have a dedicated workers for calculating color adjustments, which is by far the heaviest part of the rendering process. The number of these workers will match each system's logical processors (i.e. 4 workers for a dual-core processor with SMT/HT, and so on). We're leaving the binding of each worker to a specific logical processor to the OS, but the results so far are already quite satisfactory. 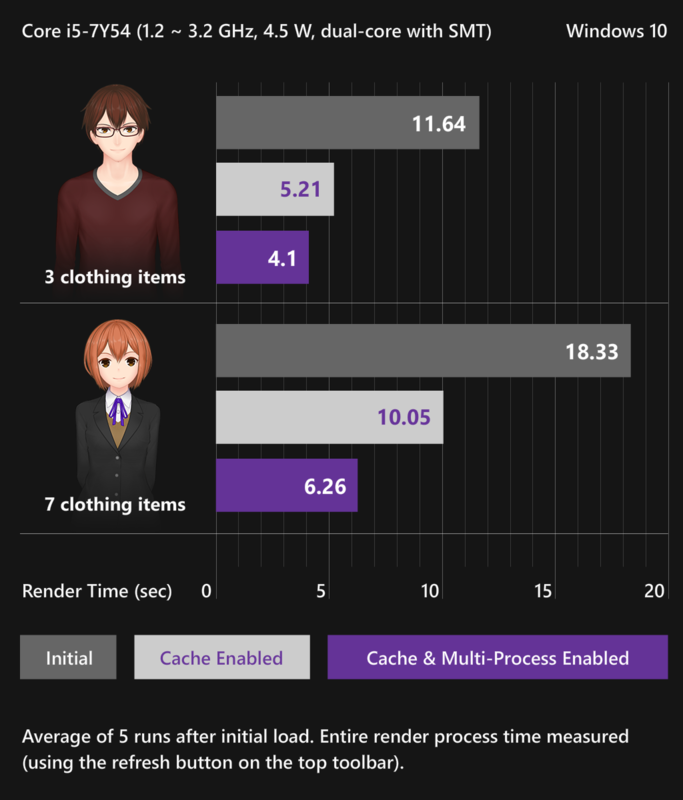 Our preliminary testing revealed that this change, when combined with cache improvements above, can bring up to 66% percent faster render time, with more details available in the graph below. We've made some adjustments to the currently available male template clothing, making t-shirts less tight and dress pants neater. Contrapposto pose were slightly adjusted. Some details were also added to every glasses available. We're planning to push all the changes that we've made in the nightly channel to the stable channel at least by the end of March, so we will be doing some cleaning up here and there. One last big change that we will be adding in the next few days before the 0.2.1 release is clothing requirements processing, which is needed to properly list and display clothing items that are compatible with your currently selected body template. That's all for today! Hopefully by each update our app is getting closer and closer to become your essential tool for video game and other artistic projects. See you in the next devlog, and don't forget that you can follow our Twitter account for more frequent, bite-sized updates.